Google announced that Dialogflow Enterprise Edition, its platform for companies looking to run their own intelligent chatbots, has launched out of beta. The service, previously known as API.AI, makes it easier for companies without AI expertise to design and deploy their own bots that use AI-based natural language understanding and processing to interact with end users. This allows companies to build their own automated customer service agents, sales bots, and other capabilities. Digital transformation is in full swing across every sector, and for compelling reasons: it is enabling businesses to create new revenue sources, transform their business models, and remain agile. According to A.T. Kearney, the adoption of digital products and services in South-east Asia is expected to add $1 trillion to the region’s GDP by 2025 – with enterprises including financial institutions investing in strategic technology solutions to expand consumer reach and acquisition as well as enhance overall operations. AT&T is touting the rollout of its pseudo-5G technology to more than 100 new markets. AT&T says that the rollout of its 5G Evolution technology serves as a network primer for actual 5G because it includes upgrading cell tower infrastructure with advanced LTE features that will support 5G when it’s ready. There are many new cutting-edge data storage apps and services available — and for good reason. Not only do these allow users to get quick and accurate insights, but they also allow for high-volume data storage, multi-platform compatibility and improved security — which are just a few of their benefits. But when considering new roles for data storage in any organization, it’s important to take a look at where exactly mobile fits into ever-growing enterprise data demands and the growing role of mobile security, too. Cisco Systems officials for the past three years have promoted Spark as the platform for collaboration among work teams to complement to the networking vendor’s WebEx web conferencing portfolio. Now the company is merging the two lineups to create a single platform that will offer a broad array of services and applications that share the same infrastructure, the same networking backbone and the same management tool. Companies worldwide are aggressively consolidating their data centers, implementing new data models, and shifting development to agile, mobile-first, cloud-based models. They’re exploring new leadership strategies and business processes, and adopting new customer engagement models, information and data models, and operating, staffing and sourcing models. They require new ways to measure their outcomes and understand the progress — or lack of it — that their organizations are making. Here are four ways IT executives are leading this global transformation — and what will happen to those who don’t. The iPhone X accounted for 35 percent of worldwide smartphone profits in the last quarter of 2017, despite reports of slower than usual sales and even though it was only available for two months. The estimate comes from a new report by Counterpoint Research, which says the iPhone X generated five times more profit than the combined profits of over 6,000 Android OEMs during the quarter. Mobile transformation is constant, of course, as innovative technologies disrupt workflows on a daily basis. But since its infiltration into the business world more than a decade ago, this may be the most important time for enterprises to harness change yet. 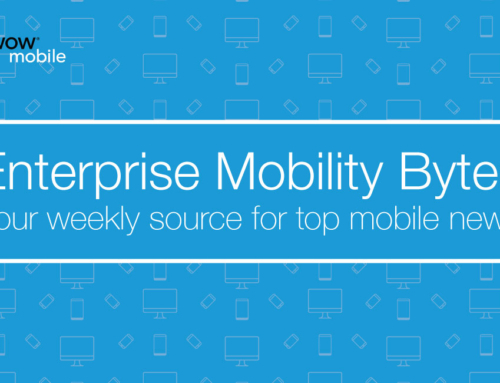 In Enterprise Mobility Exchange’s ongoing monthly column, Sit Down With The CEO, we caught up with SOTI’s Carl Rodrigues about the state of the mobile enterprise, and how IoT is changing the landscape, the next phase for EMM and MDM, and which industries will need to adapt to mobile transformation quickest. Virtual assistants are already beginning to streamline modern work lives, enabling people to multitask more productively at the office. Machine learning is helping businesses digitally transform at a rate previously unimaginable, pivoting toward a more advantageous position in the market with astonishing agility. Now that AI and mobile devices — both Android and iOS — are pairing up, AI will soon move front and center into the enterprise mobility arena. AI may even help create new and more efficient technologies for the workplace, such as employee apps, before long. Research from NETSCOUT revealed that around eight in ten IT and business decision makers believe digital transformation (DX) to be an urgent requirement for their organizations, with the average expenditure on transformative programs expected to rise from 29 percent in 2017 to 34 percent in 2020. What types of security tools actually work for the most people using connected devices? Passwords or PINs certainly have been the No. 1 choice for authentication for a lot of years, but many people believe that the time for punching in such a code has peaked. Hackers have been getting beyond passwords with impunity by simply using new tools widely available on the dark web. Enterprises have been turning to identity-driven safeguards, two-factor authentication, facial recognition and others. Innovation is always welcome in this sector, because nothing is airtight here anymore. A major new global study from IDC reveals both the main drivers of digital transformation as well as the biggest barriers to it. The study then goes another step further, uncovering the top key performance indicators (KPIs) of digital transformation success, while pointing to ways the barriers can be overcome. Travelers who rely on Microsoft Translator’s offline mode when they venture into unfamiliar territory can rest a little easier. The app can now deliver higher-quality, neural network translation services to modern iOS, Android and Amazon Fire devices even when they can’t access the company’s powerful artificial intelligence (AI) systems in the cloud. Walmart announced on Thursday (April 19) that it is testing Check Out With Me, a new service that will speed up checkout for Walmart Lawn & Garden Centers around the country. In a press release, the retailer said there are more than 350 stores with Lawn & Garden Centers that will benefit from the faster checkout service. Associates will be armed with cellular devices and Bluetooth printers, so they can scan the items with the mobile device, swipe the credit cards and print out receipts on the spot. For many enterprises, digital transformation (DX) is fast becoming a reality. IDC predicts that at least 50 percent of global GDP will be digitized by 2021, with growth driven by digitally enhanced offerings, operations and relationships. IDC expects that, by 2020, 60 percent of all enterprises will have articulated an organization-wide strategy for DX and be in the process of implementing it. These CIOs understand that tomorrow’s business must be service led; that AI and analytics, new cloud-native services, data and hyper-agile architectures can help them focus in on the needs of their customers, respond to feedback and move away from unpredictable product cycles to more sustainable service-led income. Mobile is more than just another marketing channel. It’s the nexus of all marketing vehicles. Mobile is where all varied sources, messages, and content types come together. It has proven its effectiveness in driving commerce, but few retailers value mobile as the commerce hub that it has become. In fact, mobile is still worked on begrudgingly. While many companies espouse a “mobile-first” mindset, it’s still secondary. Designing for mobile is tough, tactical, and less about creative than it is experience design. In a pre-digital economy, enterprises focused on process efficiency and effectiveness, and executed with a divide-and-conquer approach. Today the goal has shifted to architect for agility and new types of business models that empower employees and customers to innovate at a pace unimaginable in earlier generations. This shift has moved the discussion around technology platforms away from just IT and to other business divisions. Contactless payments have increased by 115 percent year-on-year in June 2017, which accounts for a total of 470 million transactions in that month alone. As a result, checks have fallen out of fashion, with payments down by 69 percent over the last ten years. Check payments now make up just 0.4 percent of all payments across the UK. IBM Research says it’s developed a new approach to in-memory computing that could give it an answer to the hardware accelerators for high-performance and machine-learning applications sought by Microsoft and Google. IBM’s researchers describe its new ‘mixed-precision in-memory computing’ approach in a paper published today in peer-reviewed journal Nature Electronics. It’s no secret healthcare has improved with technology. You can schedule an appointment with my doctor, view my medical record, and fill a prescription all from an app on my phone. Robotics has changed the way surgery is completed. Human organs are being printed using 3D printers. However, with all these amazing steps towards healthcare of the future, we are missing one important factor: digital user experience.